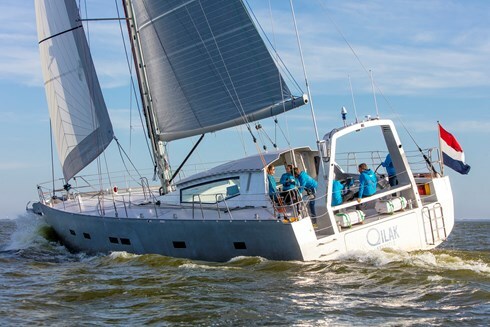 The Owen Clarke custom designed 66’ aluminium explorer yacht Qilak was launched in September 2018 at the K and M Yacht-Builders yard in Makkum, Holland. Purposeful, 'half yacht and half working boat', aptly described as a Land Rover Defender on the outside and a Range Rover on the inside. Qilak has been built for commercial charter expeditions as well as private use and as such has been designed and built to code. She represents an exciting departure for our office, building on our background of designing as well as sailing performant and reliable offshore racing yachts for short-handed sailors. The project goal was to create a commercial charter sailboat capable of being sailed by a crew of three, working in the Arctic April to October and then transiting quickly 'Ice to Ice' to Antarctica for the southern Summer polar season. Refits will be undertaken between the polar seasons and this requires the yacht to be also a fast, reliable blue water passage maker. At the same time she is capable of transiting the North-West Passage, over-wintering in high latitudes and laying up in remote parts of the world. 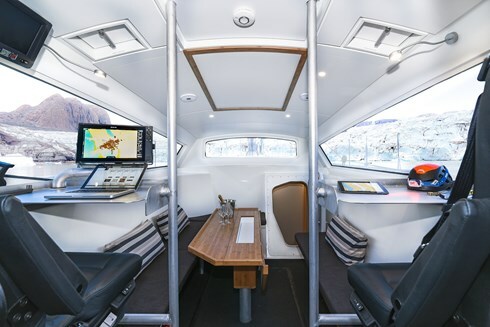 The final design is distinctly functional; particularly the pilot house which has twin interior watchkeeping positions with ‘clear screen’ viewing through reverse angled windows, for the same reasons this is a feature in pilot and lifeboats the world over. 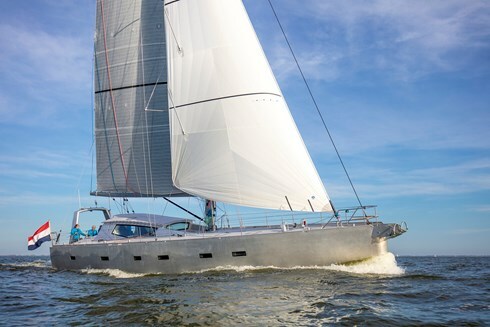 The bow area is dominated by the space required for two 70kg anchors, each with the holding power capable of grounding the yacht in excess of 60kts of wind. The triple spreader rig is designed to minimize windage when anchoring in high latitudes. The genoa and staysail are both on halyard locks and can be furled, then lowered down to the deck leaving only the working jib on the second stay (seen here) furled and aloft. Then, in preparation if required this sail can also be unfurled and lowered leaving no sails aloft, further reducing windage dramatically. In event of having to sail quickly off the anchorage, the furled staysail or genoa can be quickly hoisted and deployed. 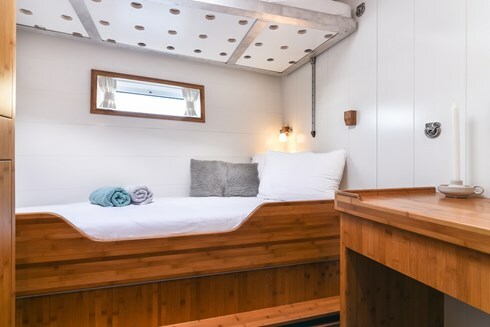 Access to the pilot house is through an exterior cuddy/covered space, then a watertight door to the two watchkeeping/working positions port and starboard. 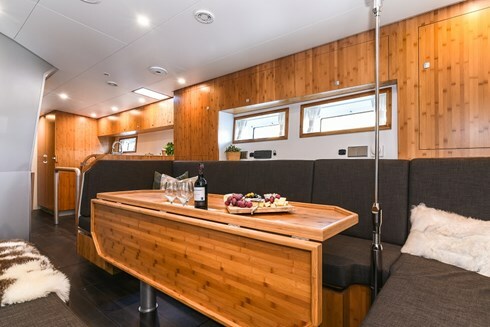 Moving forward at the same level there is a demountable table/seating system that allows this area to be used for work/dining at sea or as a cleared space when the yacht is a base for shore-going activities. Accessed through another watertight door down into the hull there is accommodation for the crew of three, plus a workshop space/cabin available for a fourth crew/guide/ice pilot. Water, fuel storage, heating and power generation can be a matter of survival not just comfort when over-wintering and so a good deal of thought and design work has gone into these areas. 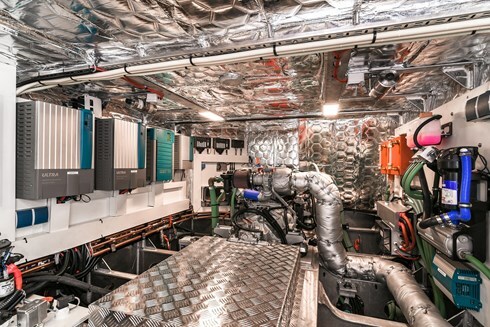 The main engine and generators do not rely on a raw sea water supply that can be blocked by ice, but are instead cooled using an internal Glycol filled heat exchanger. The diesel tanks are built into the structure of the yacht and separated from the outside skin both to keep the diesel warmer (more efficient) as well as to ‘future proof’ the vessel against impending legislation that is proposed for polar area operation.